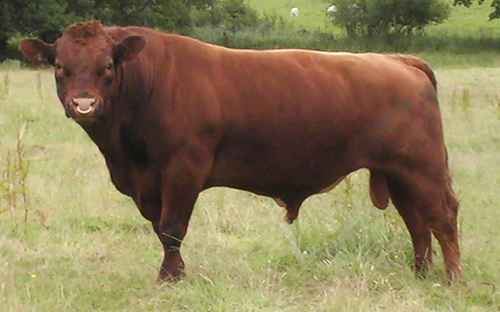 Shorthorn originated Tees River Valley in the northeastern part of England in the counties of Northumberland, Durham, York and Lincoln. They were brought to America in 1783 and were popular with America's early settlers. The American Shorthorn Herd Book was published in 1846 and was the first registry for any breed in the US. Over 30 other breeds of cattle show traces of Shorthorn in their parentage, including Santa Gertrudis, Angus and Milking Shorthorns. Although color ranges from red to roan to white, roan (a mixture of red and white) and red are the predominant colors. They are a medium size breed with a truly rectangular shape with a short, broad head and wide set eyes. And, you guessed it, they have short horns. Shorthorns are known for their early maturity, adaptability, mothering ability, reproductive performance, hardiness, good disposition, feed conversion, and longevity. In the feedlot, these cattle attain 1,000 to 1,200 pound weights at an early age and have no trouble producing carcasses that grade Choice.